Lakeside Vikings (l-r) Matthew Holt, Jack Tansill and Charlie Ludwick are helping the Vikings get in race for Class 7A state playoffs. Lakeside headed up a lengthy list of five local squads that posted perfect records in the final week before spring break. Coach Donnie Hayes and the Lakeside Vikings used a thrilling 6-5 comeback victory over Norcross March 26 on the way to registering a 3-0 mark that also included a pair of triumphs over Meadowcreek (17-0) March 28 and Meadowcreek again (forfeit). The Vikings improved to 9-9 overall and 3-3 in Region 7-AAAAAAA. 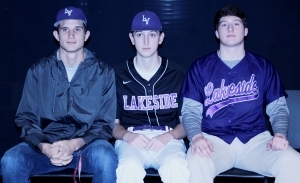 Lakeside rallied from a 5-2 deficit in the bottom of the sixth inning, plating one run in the bottom of the sixth and three in the seventh to edge Norcross in a 6-5 thriller March 26. Sophomore Levi Cloud (2-4; 1 RS) and senior Jackson Mathis (2-4; 2 RBI) registered multiple hits for the Vikings and freshman Joseph Garcia earned the pitching decision with four strong innings that included allowing only two hits, one run and one walk to go along with one strikeout. The Vikings also pounded Meadowcreek (17-0) March 28, as senior Jack Tansill tossed a no-hitter and struck out four over three innings. Cloud (2-2; 1 RS; 1 RBI) paced an eight-hit offensive attack. Coach Tyrus Taylor’s Southwest DeKalb Panthers remained in the thick of the hunt for a state playoff berth out of Region 5-AAAAA with two impressive victories over Columbia (5-0) March 26 and Columbia again (6-5) March 28. The Panthers moved to 12-5 overall and 6-2 in the league. Coach Samuel Marion’s Lithonia Bulldogs continued their improved play with two Region 5-AAAAA decisions over Cross Keys (21-0) March 27 and Clarkston (17-0) March 28. The 2-0 run moved Lithonia to 8-7 overall and 4-2 in the league. Lithonia senior Lorenzo Bell hurled a three-hit shutout in a 17-0 triumph over Clarkston, striking out 11. Senior Mykal Martin (3-4; 2 RS; 2 RBI; 1 2B; 1 3B) and sophomore Theodore Riddick (3-5; 3 RBI; 1 2B) topped a long line of offensive stars. Tucker is now 27-0 in Region 4-AAAAAA action over the last two years. Coach Matt Masce’s Tigers swept a pair from Lovejoy (16-0) March 28 and Martin Luther King Jr. (17-2) March 29 to improve to 13-7 overall and 11-0 in the league. Miller Grove rounded out the list of undefeated teams from last week. Coach Terrence Canty’s Wolverines knocked off Cross Keys (16-0) March 28 to move to 6-6-1 overall and 2-3 in the Region 5-AAAAA. Druid Hills pulled out two key Region 4-AAAA triumphs over Luella last week to remain in the hunt for a state playoff berth. Senior Mason Curtis turned in a superlative mound effort in a 4-2 decision over Luella March 26, striking out five while allowing no earned runs, three hits and one walk over seven innings. Junior Brandon Thomas paced the Red Devil offense, going 2-3 with one RBI. Senior Jackson Hogan then matched Mason with a second straight stellar pitching performance for Druid Hills in a 1-0 blanking of Luella March 28. Hogan went the full seven innings, striking out six and allowing only four hits and one walk. Senior Joseph Hiley drove in the lone run of the game, plating junior Ali Desrochers with a double. Sophomore Ryan Pruitt (WP; 2 IP; 5 SO; 2 HA) and junior Jordan Whitening (1 IP; 1 SO; 1 HA) teamed up for a three-hit shutout for Redan in a 16-0 victory over Stone Mountain March 29. Junior Ga’von Wray recorded a third straight no-hitter, striking out seven over four innings in Stephenson’s 15-0 blanking of Lovejoy March 26.